It was a trick. Leaves scattered the ground, crunching underfoot, and yet the sweater I wore felt hot and balmy. After parking my car (an impressive parallel for this country girl), I riffled around, grabbing my bag and unnecessary coat when I saw her. She juggled more bags and straps than I, making cautious eye contact in case I wasn't the right person. "Lauren?" I asked. She smiled with relief and we walked awkwardly like strangers do into the swamped coffee shop. With our eyes on the window light, we moved from table to table trying to find a proper spot away from the expected annoyance of others. Finally, we moved into the hall, placing sipped coffees on the bench and attempted to get comfortable for the third? (fourth?) time. We laughed at the gawkiness of the situation and finally broke the ice with comfortable conversation. We as photographers have a job to make our subjects look and feel their best. It is our genuine desire to succeed in this. We have a platform to share beauty and accompany it with words to lift up others, and to document life in it's variety. However, as photographers, it is so easy to get caught up in capturing the beauty of everything around us and to hide ourselves on the other side of the lens. I have been very candid about my struggle with accepting my weight gain, but I'm not the only one feeling these pains. How can I embrace and embody the ideology of accepting oneself if I do not show that I have these struggles as well, but that I am working to conquer them by getting in front of the camera just like you? Lauren had similar feelings as well. We want to be present for young women, client or no, and for ourselves. Everyone should have the opportunity to feel beautiful- skinny, fat, pale, dark, short, tall- it makes no difference. Beauty is in everyone and everything, you just have to open your eyes to see it, and turn down the noise that disguises it. We left the coffee shop for an apple orchard and thrived on the openness and the rustling of leaves in the breeze. We started to laugh, to make silly faces and relax. The air wafted with overripe fruit and we started working it. Lauren and I left that night with beautiful photos to trade with each other and lighter hearts warmed by truth. If you're struggling with self love and want to do something about it, I'd love to chat about doing a Britt Beauty Session! These sessions are designed to embrace self love and lift up fellow women. 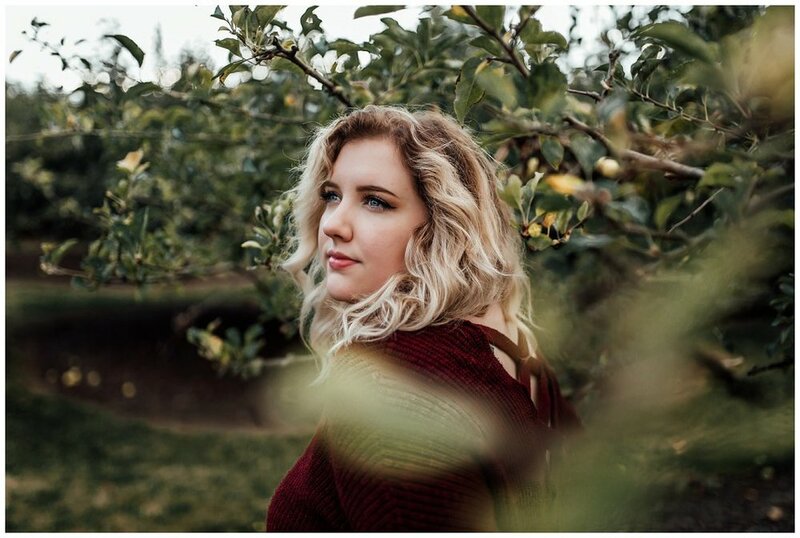 Brittingham Photography specializes in natural High School Senior portraits, but also offers Britt Beauty Sessions (individual women's shoots), Lifestyle Newborn, couples and family photos. Thank you for stopping by to read my little blog!